Hold your warhorses! It’s another tale of expectation and bitter disappointment. Well, not really..but being pregnant, I tend to take these things worse than I would otherwise do. Did I mention I was pregnant? Ah yeah, hence the lack of activity recently both blogwise and y’know…actually leaving the house-wise. At 17 weeks, I have a small amount of energy but don’t expect it to last. But do expect hilarious, sleep-deprived anecdotes about London with a toddler and a newborn , written around next April. At 3AM. So, having this small amount of energy, I decided we would go on a Day Out. We walked to Victoria for a Nandos, most of which Reuben slept through so it was almost like a date. Then we walked to the National Army Museum (2.8 miles in total walked. Get me.) and, yes dear readers, that’s when the disappointment happened. 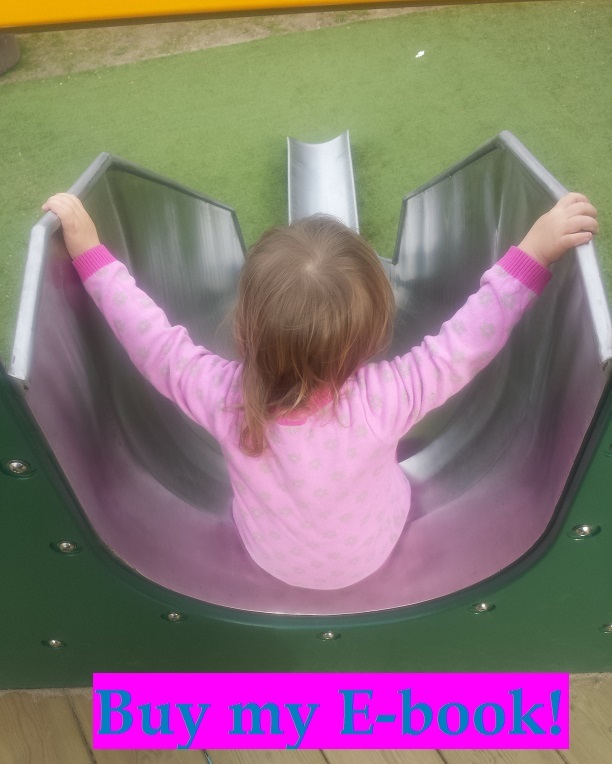 Because the playzone we’d visited about a year ago – which had been recently refurbished and revamped and by the looks of things moved to entirely the other side of the museum – was full for the afternoon! And also no longer free! Only £2.50 but still…I was crushed with disappointment. Devoted readers will notice the similarity to the experience in Brockwell Park – when I make any kind of physical effort (i.e. walking somewhere), the disappointment is hard to handle. Two things redeemed the afternoon. The first being that Roo didn’t seem to know or care that there was a whole softplay area that was out of bounds to him. The other being that the rest of the museum was really rather good and there was lots for him to do. The entire site has changed round since last time we went, so there was a lot for Nathan and I to see too. 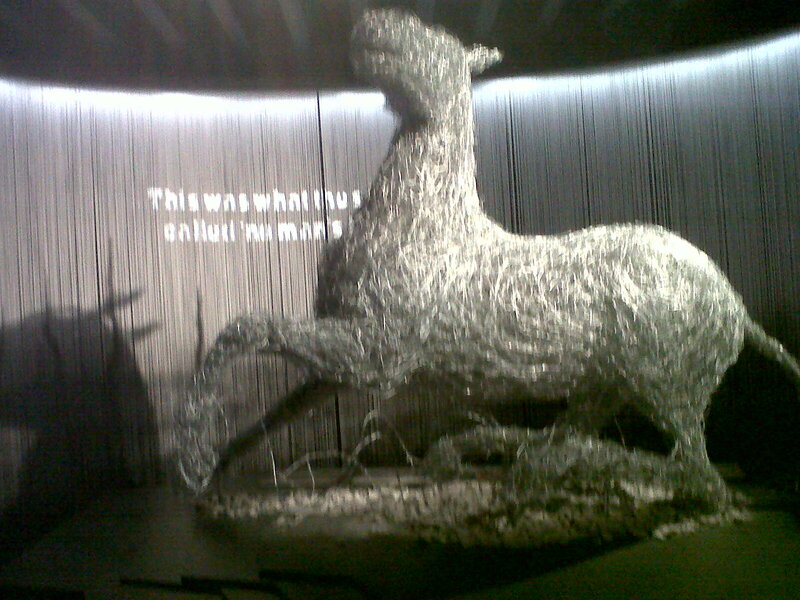 First up was the War Horse exhibit, which was extensive and great for a small boy who likes looking at horsies. 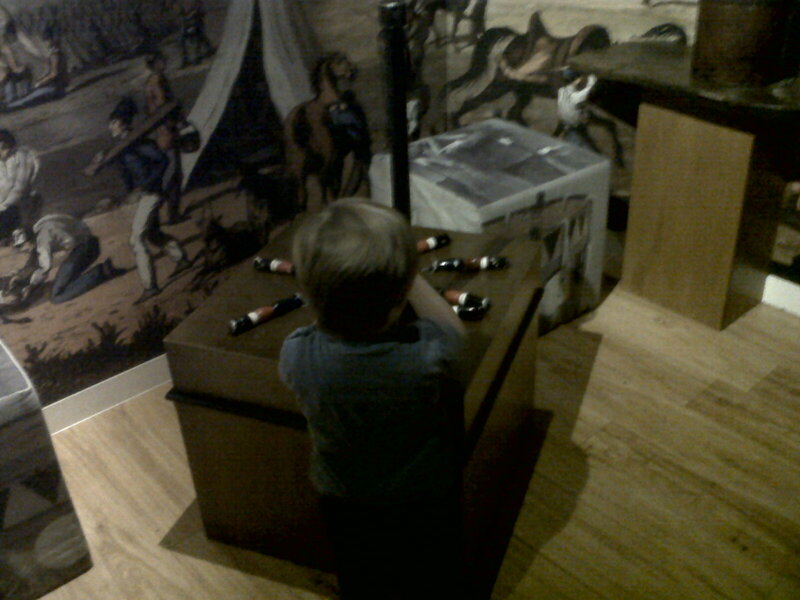 We spent about half an hour in there – toddler friendly bits included a horsie version of Guess Who, a table with cut out horses and crayons to colour them in with and a couple of saddles where a boy could sit happily and shout “clip clop clip clop NEIGH!” and generally disturb anyone else who was browsing the exhibit. 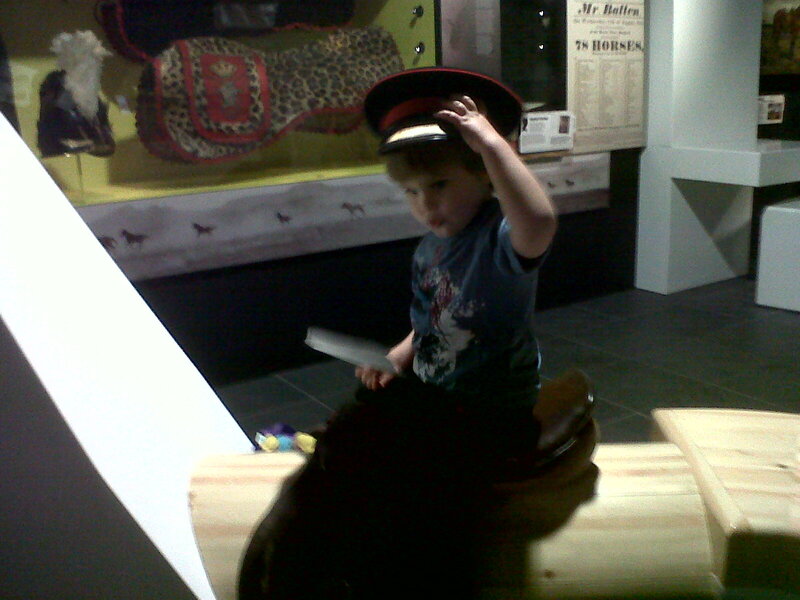 There was also a hat and military jacket to try on, Roo loves a hat. And doesn’t he look good in it? More hats were to be found in the galleries on the other side, in the Indian uprising section (see picture at top. 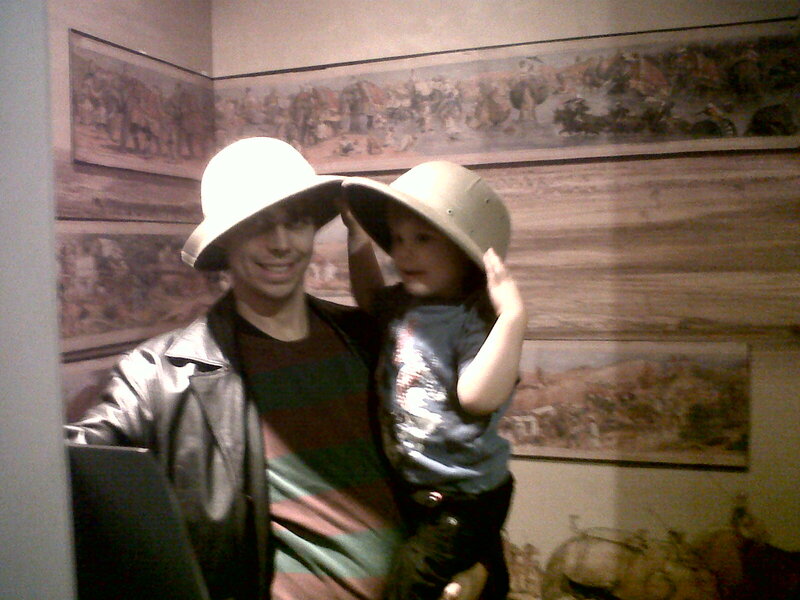 Nathan also suits a hat). There was also a game of soldier skittles, operated by pulleys, that all the small boys loved. Roo didn’t quite get the idea that you had to let go of the ball, he just picked the ball up and bashed all the soldiers until they fell down, but never mind. All these photos are very dark again, aren’t they? Why do they make museums so dark? And why are blackberry cameras so rubbish? Anyhoo, I think there’s something quite poetic about this shot – the fallen soldiers and the victor. Can’t wait to see him reproduce this game with his little sibling *insert suitably scream-faced emoticon here*. VERDICT: Suprisingly, plenty to do even without playzone. Roo was happily occupied for almost two hours. Definitely need to go back for playzone though! This entry was posted in Token attempts at culture (museums) and tagged horses, museums, rainy day places, soft play, war, West London. Bookmark the permalink.